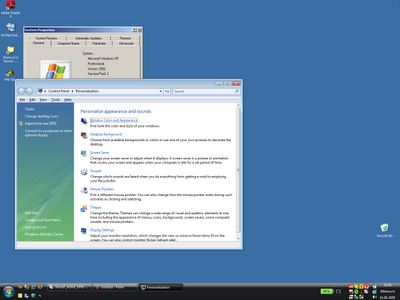 One might think that using a non-classic theme under windows XP or higher is just a matter of the look of windows. I thought so for myself until I found a real cool feature just by accident and investigated it a little bit. You might know the following situation: You are running a virtual machine in full screen mode because it is your current main occupation. But once in a while you have to switch back to the physical host machine to read your mail or alike. Correctly. Hopefully you can remember what you host key settings are (I like using the scroll-lock-key because I do not use it for the function it's originally intended), hold it down while hitting the return key. 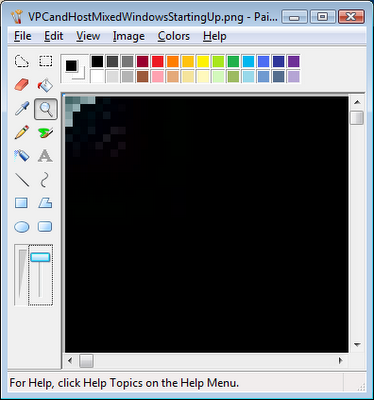 So, the virtual machine window restores and you're back where you wanted to. 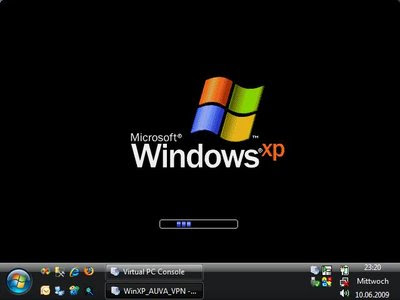 Then, when you're done with the tasks on the host machine, you will bring the window running the virtual machine back on top and again maximize it using the host-key together with return. If you have to do this every twenty minutes or so that can be really unsatisfactory. But, there may be some light for you at the end of the tunnel. When restlessy moving around with my mouse I could not see the arrow because I just had a windows in an early stage of the boot process in front of me. But, some times a big arrow flashed up, namely when I hit the left or right top corner of the window. Although I'm not a gamer, I know: "when there's a mouse cursor, I can click.". And so I did. Meanwhile the desktop of my virtual machine showed up and I tried the task switch (Alt-Tab). 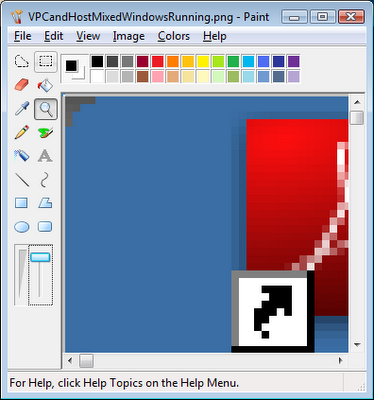 And, astonishing, the Vista task switch came up (including the desktop-icon)! So I learned, that even from within the full-screened virtual machine I can put the focus back to host machine by clicking one of the top corners. And yes - it is about the rounded corners of the desktop theme I used with Vista. A temporary switch back to classic mode proofed that the feature (is that by design?) disappeared.